Betty has a banana and wants to eat it. The trouble is she can’t work out how to open it and this makes her VERY upset. A helpful toucan tries to lend a hand by peeling it for her but Betty wants to do it herself. She has some very big tantrums in this story. Children (and parents!) will relate to her frustration. A striking book with bold use of colour; Betty’s tantrums are on bright red pages. This is a simple, well told story with a very appealing character. Before you start reading look at the cover together and talk about what children can tell about Betty. Read the title of the book and talk about what it might mean and what children think might happen in the story. As you read the story pause before turning the pages on the ‘Suddenly…’ or ‘until finally….’ to talk about what children think will happen next. 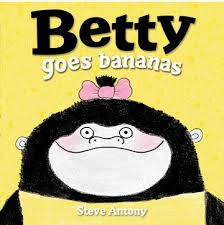 When you finish reading the story share favourite pages, talk about Betty’s feelings and think about what Betty will do with the second banana she finds. When you read the story again encourage children to join in with the repeated parts eg ‘Betty cried and snivelled…’ or the Toucan telling her ‘There is no need for that! It would be fun for children to play the part of the sensible, mature toucan perhaps with a toucan puppet (see below). Draw a picture of Betty having a tantrum and another where she is much happier, eating her banana. Click here for a template. Children could choose a soft toy to be Betty and then with themselves as the toucan, perhaps holding their puppet or another toy they can act out the story. You might want to use a real banana as a prop! Betty likes bananas. What else might she like beginning with ‘b’? Perhaps baked beans to eat or balloons to play with? See how many things you can think of together that Betty might like. Download a Betty Goes Bananas activity booklet here.